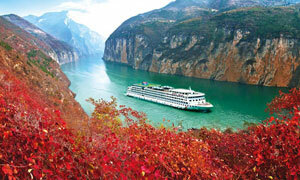 Choosing a suitable cabin is very important for putting together a perfect Yangtze cruise. It is a personal decision, depending on a traveler’s budget and lifestyle. There are basically four essential factors to consider when making a decision: the ship’s star rating, the ship’s operating history, cabin types and cabin locations. Generally speaking, the higher the ship’s star rating is, the better cabins the ship is equipped with. The cabins may have better wooden furniture, softer beds and high-quality baths. 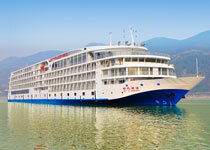 The Yangtze cruise ships on China Highlights are all five-star and four-star ships, but with different price levels. The shorter the ship’s operation history is, the newer its equipment is. The last refurbishment date of a ship also should be taken into consideration. 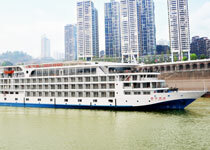 Most of the Yangtze cruise ships on the China Highlights website are relatively new or have been refurbished. For example, the Victoria Jenna is a five-star ship and its maiden voyage was September 6, 2009. That is to say the cabins of the Victoria Jenna are comparatively newer than those of the Victoria Anna (year built: 2006), although their prices are almost the same. 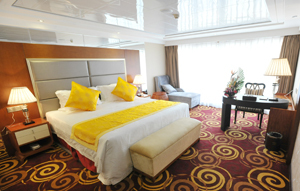 The price of a Yangtze cruise ship cabin is only dependent on its type. 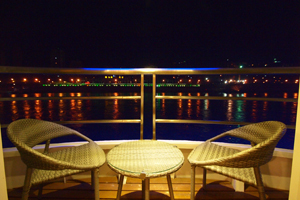 There are three or four cabin types available onboard different ships on the Yangtze River. They are often advertised as standard cabin, junior cabin, deluxe suite and supreme deluxe suite (such as Shangri-la Suites on a Victoria Cruise, President Suites on a President Cruise and Imperial Suites on a Yangzi Explorer vessel). Some ships such as the Regal China have single cabins. China Highlights have described what is provided in each cabin in each ship. Click Here to Investigate. 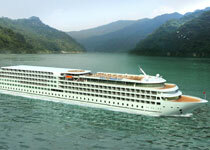 Standard Cabins on Yangtze cruise ships run from about 14 m² (150.7 ft²) to 21 m² (226 ft²). However, the exceptional standard cabins on the Yangzi Explorer are 31 m² (333.7 ft²). The cabins are usually equipped with twin beds, carpet, individual air-conditioning system, LCD TV, satellite programs (e.g. HBO, CNN), telephone, dresser, mini-bar, hairdryer, and a private bathroom with shower, toilet, sink and toiletry shelves. 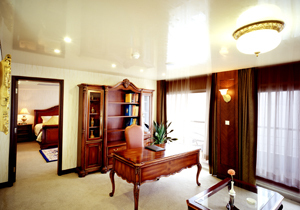 Some standard cabins feature personal safes, a table, a desk with chair and even internet access (often much more costly than in the common internet lounge). These standard cabins have large outside windows, but many of these windows can not be opened. It’s important to ask whether the windows can be opened or not. If you want to enjoy the river breeze and sunshine in your room, you may need a cabin with private balcony. 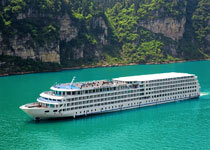 Many Yangtze cruise ships have standard cabins with private balconies. A standard cabin with a balcony will not cost you much more than a standard cabin with just a window. For example, on Yangtze River (President No.4) and Yangtze Paradise (President No.6), a balcony cabin will cost you only 10 percent morethan the price of a standard cabin with just a window. 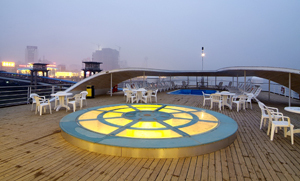 Cabins on many of the Yangtze cruise ships, such as the Victoria Cruise fleet (except the Victoria Rose) and President Cruise No. 1, are all with private balconies. These cabins have sliding glass doors, giving you access to the outside. Even lie on the bed you still can see the river outside. The balconies are often narrow, just wide enough for two chairs and a small table. Sitting on the private balcony, drinking a cup of coffee or wine, enjoying the river breeze and watching the sunrise or sunset - that is the life!Although you also can do these things on the sun deck, your own balcony makes them private and convenient. Junior cabins are usually 10 m² (107.6 ft²) larger than standard cabins (almost twice the size in some cases). A junior cabin will cost you from 25 percent more to double the price of a standard cabin depending on the ship. If size is important to you, you can choose a junior cabin. They are usually balcony cabins and the balconies are larger than that of standard cabins. They have all the amenities found in standard cabins, and many have larger bathrooms with bathtubs, tea tables and a small sofa. Some junior cabins have VCRs or DVD players. Some junior cabins are advertised as junior suites, which is misleading, as there is no separate living area per se, just a fair bit more floor area. Therefore it’s important to ask and look at the cabin layouts before booking. A deluxe suite has all the amenities found in a junior cabin, with a small sitting area at the entrance, a lounge with a curtain to separate it from the sleeping area, or even a separate bedroom. It is especially suitable for people on a business trip. The sitting area can be used as a small meeting room. 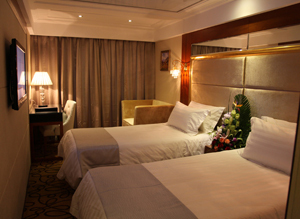 Most Yangtze cruise ships have two to four supreme deluxe suites. They are usually located at the bow of the middle deck, and many have a private mini kitchen, sitting room, separate bedroom, delicate wooden Chinese furniture and decorations and a private deck with chaise longues, armchairs and a drinks table. It is perfect for people who have a high budget and pursue a romantic and deluxe lifestyle. Note: Some cruise companies including President Cruises sell cabin upgrades at reduced prices to passengers when they board the ship for the cruise. Discounted cabin are available at the time of boarding only. Customers wishing to upgrade to a higher standard of cabin at the time of boarding should inquire about vacancies upon boarding. Please note that upgrades are based on availability only. 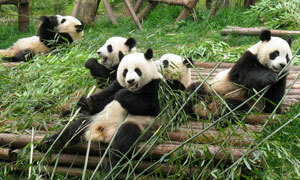 China Highlights suggest to book your cabin at least 30 days before your departure to avoid disappointment, especially if you travel in high season like April, May, September and October. Cabin locations have no bearing on the prices of Yangtze cruise ship cabins, because prices are only dependent on cabin type. Different cabin locations have different advantages and disadvantages. Let’s take a look at the layout of most ships. Dinning rooms are usually located on the lower decks, while almost all entertainment areas are situated on the higher decks. 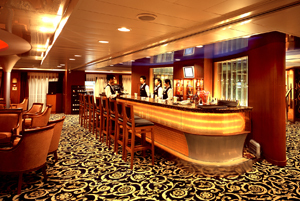 Closer to sun deck and all the entertainment areas, such as bars, card rooms, reading rooms, internet bars and spas. Further from the dinning rooms and reception. You may need to start a few minutes earlier for meals and to meet at reception for shore excursions. Otherwise you will meet a lot people on the stairs or in small elevators. You will experience more rocking motion up high, so those who are seasick prone might want to avoid a higher deck cabin. 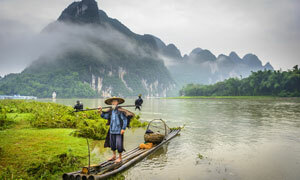 Seasickness happens less during a Yangtze cruise than that on an ocean cruise. Closer to dinning rooms and reception. Experience a smoother ride than those in higher deck cabins. Further from the sun deck and all the entertainment areas, such as bars, card rooms, reading rooms, internet bars and spas. If you like enjoying views on the sun deck and entertainments, you’d better choose a higher deck cabin; otherwise you will be climbing the stairs or riding the elevators more from a lower deck. Views are more limited than from higher deck cabins. As cabins of the same type in different locations cost the same, you can choose according to your own preferences. Cabins located on the middle deck can be a good choice as they are neither far from the sun deck nor the dining room. However, there may be more passenger traffic outside. Selecting a cabin is as personal as deciding which ship to cruise on. Everyone is different, and what is not important to one person might well be important to you. How much time you plan to spend in your cabin is a very important factor for choosing a cabin. You might want to spend a little more money for a better cabin with a balcony, if you want to spend more time relaxing in your cabin, watching TV and enjoying private sun bathing. If you would enjoy sun bathing on the sun deck with other people’s company and playing card games in the card rooms, a private balcony may not be that important to you. China Highlights provides comprehensive details of our range of ships and cabins. Click Here to See.